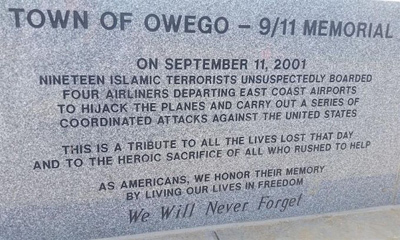 OWEGO, New York 9/7/16 – The Children of Abraham of the Southern Tier, an Islamic group, has taken offense at this little upstate New York town's new memorial honoring those who died in the September 11, 2001 Muslim terrorist attacks in New York City that killed over 3000 people as well as many more in a simultaneous attack on The Pentagon in D.C. with another plane headed to the Capitol which was thwarted by passengers who fought off the attackers as the plane crashed in Pennsylvania, killing everyone on board. According to Journalist Todd Starnes, the memorial plaque, to be dedicated this Saturday, identified those responsible for the attacks as, "Islamic terrorists." Of course, this will never do, says a spokesperson for Southern Tier, who demanded that the words, Islamic Terrorists" be changed since, "this would encourage hatred toward Muslims." We can't have that, y'know. Owego City Manager Donald Castelluci refused the demand, stating that he would not change a single letter in the town's memorial. CHEERS! At last an official who will not bow down to "political correctness." It is to be hoped that all American citizens will wise up as well. The plaque honored a local citizen, Derek Statkevicus who was killed in that attack while working on the 89th floor of 1 World Trade Center. The hypnotic state most Americans live in today is so dense that they allow these terrorists and potential terrorists not only into America, but have allowed them to set up ISIS training camps here to train for further attacks and deaths from the inside of our country. This is nuts! In New York State, where this memorial protest by Muslims is taking place, has at this moment...now sit down...six ISIS training camps set up in The Empire State under total protection due to the cooperation of knuckled-headed politicians, meaning that nobody is allowed into those camps which has heavily-armed guards in military style gear to enforce that 'no entry' policy. Those camps have been set up throughout the U.S. The misguided and uniformed have called Presidential Candidate Donald Trump a liar, for stating that Muslims were cheering and dancing on a roof top in New Jersey, across the river, as they watched the planes crash into the Towers. That is NOT a lie (Only one of the candidates has mastered that skill). This writer personally saw the television coverage that captured the dancing on the rooftop by delighted Muslims. So this demonstration is a FACT. People who accuse Donald Trump of lying are judging others according to their own standard of conduct. Another observation by this writer who was following everything on television, A Muslim cleric with a smirk on his face stated to the nation: "See? This just proves that our god is more powerful than your God." That statement alone verifies that Muslims and Christians DO NOT worship the same God as Muslims attempt to convince the world otherwise. There never should have been a question about that. "Frankly my dears, we don't give a Kraepernick."